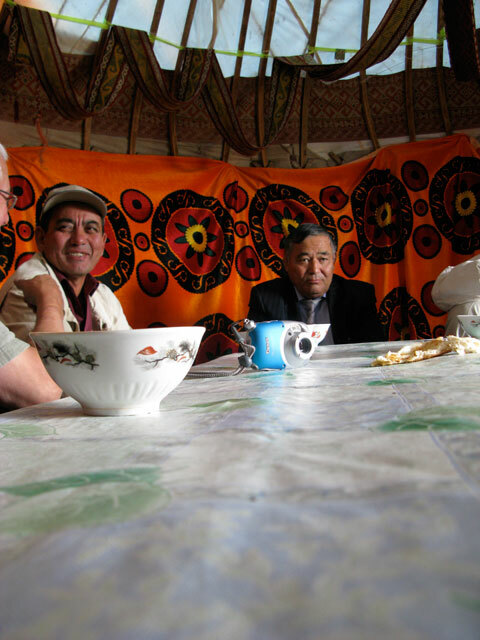 While we were in Biazak County, we were fortunate to be treated to a local tradition when Bildabek (the Biazak County Agricultural coordinator) took us to a roadside yurt for horse milk. It is called Kumish and is beloved by Kazaks. It was an honor to be invited to share. 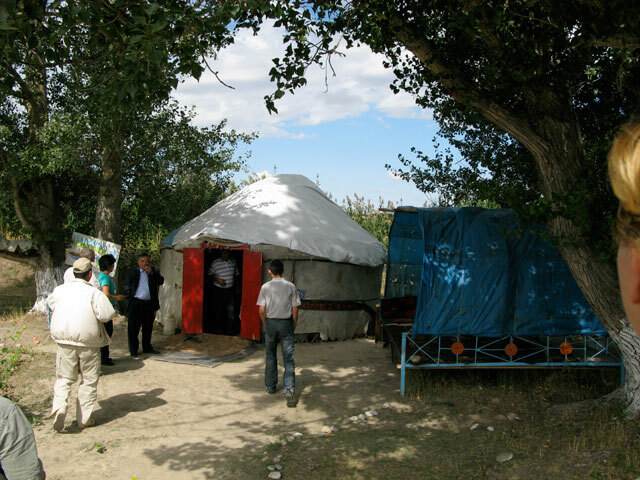 We sat on the floor of the yurt around a low table and a young woman ladled cold Kumish from a barrel for each of us. To be perfectly honest, I was imagining the food poisoning I would be enjoying later in the day. That is a little embarrassing because Kumish is fermented and laced with preservative spices, so there is nothing to worry about. The fermentation made it very sour and the spices must have been smoked because I could taste that too. The locals claim it can cure tuberculosis, which is a serious problem here. 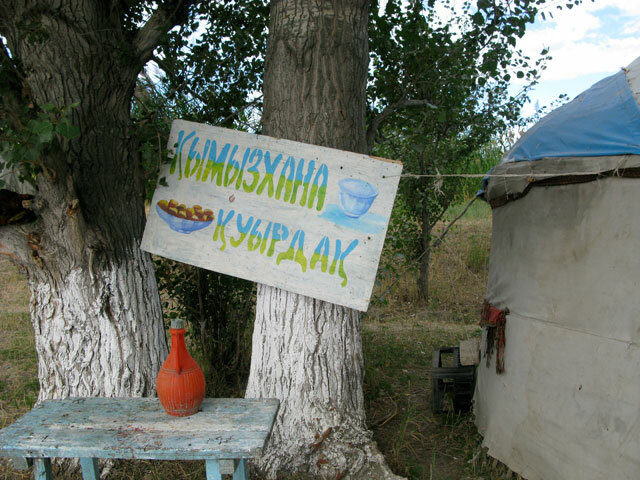 In fact there is a TB sanatorium where a steady diet of Kumish is the primary treatment. In addition to horse milk, camel milk is also very popular. We briefly saw a camel dairy outside or Taraz last week. Now that I think of it, I have not seen cow’s milk since I arrived. The primary dairy is horse and camel. We visited a market yesterday that had a big dairy section where women were ladling up horse milk and camel milk. They were also selling the most unusual cheese I’ve ever seen. They were curds that were pressed and completely dried into hard and crunchy cheese balls. I suppose people started doing that to carry cheese while they were traveling. The market was amazing. I have great pictures and lots to say about that. I’ll probably have to break it into several posts because there was so much to see and think about. 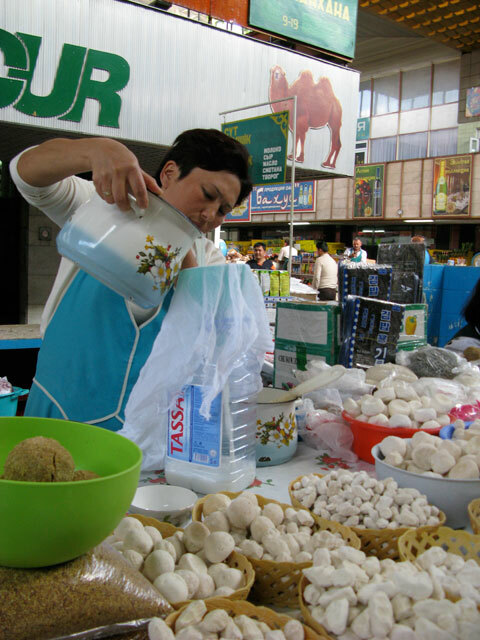 A woman pouring camel milk through cheese cloth. See the camel on the sign letting you know this is the dairy section? The white balls in front of her are the dry cheese.